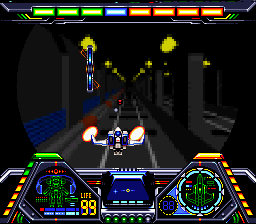 Accelebrid is a chase-view shooter. 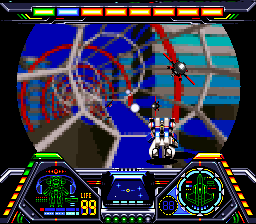 I guess it might be compared to Iridion 3D, but as I haven't played Iridion 3D, I wouldn't know. 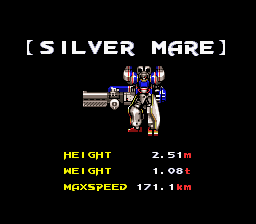 Basically, you play as this guy named Ginei, who happens to be the pilot of the Silver Mare, an eight-or-so foot tall, high-powered suit of armor, armed to the teeth, which he races. 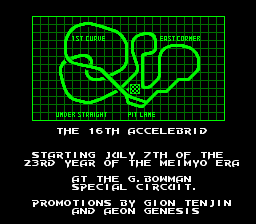 The upcoming race is the 13th famed Accelebrid, and it's being held at the G. Bowman circuit. 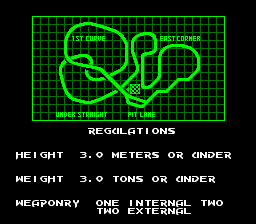 During the race, however, a group of terrorists attacks, hijacks the tracks built-in obstacles, and kidnaps the owner of Ginei's team (who also happens to be his girlfriend or something.) Armed with nothing but vengeance and his high-powered combat suit, Ginei leaves in hot pursuit. You've got a radar at the bottom of the screen which you will NEED to get used to using if you want to survive. 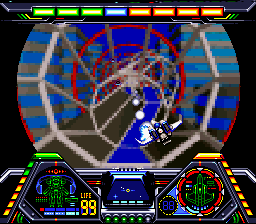 The game also sports six different weapons with which to arm the Silver Mare, as well as multiple possible endings to the game. 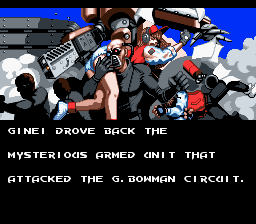 Translation's totally taken care of (not like you need it to play the game, but still.) Have fun!